How time flies. 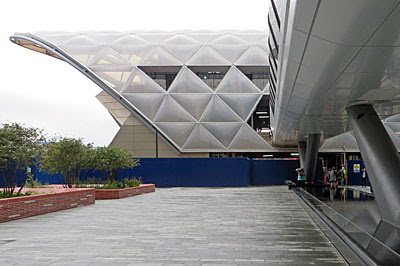 A couple of years ago, when Canary Wharf's Crossrail station opened up for Open House, it was very much work in progress. A deep hole had been dug in the north dock and various layered cavities created, with temporary metal staircases descending into the earth to track level. There were no platforms, indeed there was as yet no tunnel because the giant drilling machines had yet to break through. Only a few fortunate souls gained admittance on that day, and hard hats and hi-vis were a requirement for any civilian entering. How things change. 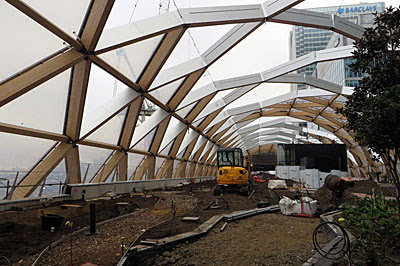 This is a unique opportunity to view the Canary Wharf Crossrail site ahead of station completion in 2018. The structure is built in a reclaimed dock and is 6 storeys high, making it large enough to accommodate One Canada Square on its side. Entry Details: First come basis. Self-guided walk through the site using designated segregated walkways. 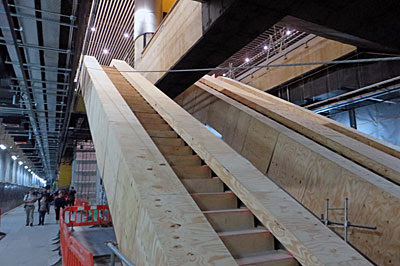 Entry Areas: Tour will include viewing of platform level, ticket hall, retail areas and roof gardens. The way in's unusual, via a long squat hexagonal bridge. This elevated tube looks like something out of Space 1999, and walking through it is somehow equally futuristic. It links across the dock from the North Colonnade, which is the side of Canary Wharf most people never go. The entrance isn't opposite anything useful like a road or a passage, and the DLR disgorges passengers a little further up the street. It all makes more sense if you thread through at shopping mall level, one rung down, because there's a direct connection past the shops which comes out immediately underneath the aforementioned bridge. Here the supports land in a rippling black water feature, an echo of the dock inlet that used to be here before Crossrail filled it in. What you need to know about Canary Wharf railway station is that most of it has nothing to with trains. At ground level and above, beneath the long latticed wooden roof, the whole thing's about encouraging you not to travel anywhere. Somebody looked at central Docklands and decided what it really needed was more retail, this in addition to the two enormous shopping malls immediately adjacent, because bankers and financial services personnel have an inexhaustible amount of plastic to spend. Hence there'll be sandwich shops and luxury units around the edge of Station Island, where we got to walk yesterday, not that this was necessarily easy to imagine. Indeed heading upstairs into what looked like a large concrete void we were told this will one day be a restaurant. It'll be amazing what a good fit-out can do. The first moment we Open Housers all stopped and waved our cameras was when we stepped out beneath the wooden canopy. It looks like a geodesic jigsaw, occasionally open to the sky but mostly not, which was helpful in the rain. The western end faces West India Quay station, so this is a premium location, hence I'd expect the restaurant to spill out onto a rear terrace with views across to the City. Much more impressive, from a public access point of view, is the Roof Garden approximately half way along the upper level. They're landscaping this at present, with broad pathways wiggling through what are currently earthen beds. A few palms are in, plus two lonely trees, but eventually there'll be 170, plus 1100 shrubs and 14000 plants, in a space that might even rival Joanna Lumley's bridge. And down, and down, and down, and down. When you come in 2018 there'll be escalators, but for now they're boarded over and extra special care is required to descend. The first underground chamber running the entire length of the station is the ticket hall - a quaint term given that TfL will quite possibly have extinguished small cardboard permits to travel in four years' time. It's vast, and needs to be given the numbers of passengers expected to flow through. Surprisingly few supports are required to keep the roof up, but try not to think about this, nor the fact you're now below the waterline within the scooped out dock. The final descent, down a none too capacious bank of escalators, leads to Level Minus Six. This is platform level, not that you can see the tracks at the moment because they're completely sealed off behind temporary walls. It's a high-ceilinged space, currently with lots of exposed masonry and metalwork, although how much of that will be hidden away later I'm not sure. Plenty of tools and machinery are also lying around, for now, because the fit-out down below is not yet complete. But it's still impressive progress given that two years ago this chamber was entirely platform-free, and now you can almost imagine where the roundels will go. You don't normally have to queue to exit an Open House building, but when you're half a dozen floors down with no escalators the one functioning lift takes a bashing. Staff eventually worked out that most of us were fit enough to take the stairs, so led us up a considerable number of backsteps - not a route I expect you'll be taking if you arrive by train. And while that may be four years off, the upper levels of this station are due to be pressed into service as early as next year so that management can make as much profit as possible from their retail offering. So don't expect Canary Wharf Crossrail to be open for Open House again, expect to get inside as an everyday part of London life rather sooner than you might imagine.